Visitors touring the Elevator Museum have received their early impressions of the elevating technique from drawings that were rough at the outset. The sketches improved steadily as those with innate artistic ability and mechanical knowledge became adept at depicting the machinery or lifting process with realism. Eventually woodcuts and etchings passed on information concerning the industry with increased realism. As the creation of valid representations became less labor intensive an increasing number found their way into company brochures and catalogs, thus preserving information for future generations. The invention of the camera was a milestone event for those wishing to capture a true image of equipment or installations. The ease of photo taking and reproduction meant that every component, as well as the complete elevator or escalator installation, was preserved in detail. Photography became so engaging that, for the first time, pictures were taken of the environment in which the industry's equipment was manufactured and installed - the shop, the job site, the founders, the first product, the members of associations. Future generation would be able to comprehend the human nature aspects of the by-gone field in its totality. As wondrous as words were, the descriptions of the world surrounding the lifting mechanisms had remained sparse. It remained for the photographs to inform future generations of exactly "who" accomplished "what" in a particular environment. Now museum visitors of a present generation are able to truly visualize the industry and environs of the past generations. He who stated, "A picture is worth a thousand words" was sage, whether a Chinese or not! It is hoped that this Gallery will grow apace with photos of "founders and their companies/associates", "the original manufacturing site", the "honored seniors" and other human interest that will bring the elevator industry of the past to life. Man does not live by machinery alone! The photo of the Maintenance Co. of Long Island indicates that a truck, a roadster, a motorcycle with sidecar and vans provided maintenance and service in 1920. Stigler construction mechanics were always ready to pose after work hours as they ranged far from their home base in Milan, Italy. These photos from the collection of Paolo Belletti were taken in 1912. Paris, Cairo, Leningrad, Berlin, Bucharest and Constantinople were among large cities in which Stigler lifts were installed in private and public buildings. The photo at left was taken in Russia while that at the right shows the crew closer to home in the Venice Bell tower in St. Mark's Square. The shop crew of the Haughton Elevator Co. is shown with the tools of their trade in 1870. The founder, Nathaniel Haughton, is in the front row center (with bow tie). This undated photo is of a baseball team fielded by the Gurney Elevator Co. Only one extra player is shown — perhaps a relief pitcher? The original frame home of the Sedgwick Machine Works, Inc. was photographed in the lengthening shadows of a Poughkeepsie autumn day. Alonzo Sedgwick and his cousin, J.I. Wakelee, began building lifts here in January 1893. The former's wife, Annie Brown, was the first bookkeeper and secretary. Wakelee's mother mortgaged her home to augment the slender resources making this "first place" possible. Chicago Manufacturers Association — October 1921 In this photo are noted names of the era: Atkins, Haughton, Hecht, Hollister, Kieckhefer, Lindstrom, McKesson, McLauthlin, O'Keefe, Pitt, Reed, Reed, Reedy, Rosenberg, See and Turnbull. The premises of George Johnson, Ltd on St. John's Hill at Battersea, London c. 1900 are shown in the left photo. The founder of the lift company in 1850 — George Johnson — is standing at the left while his shop men are grouped at the right. 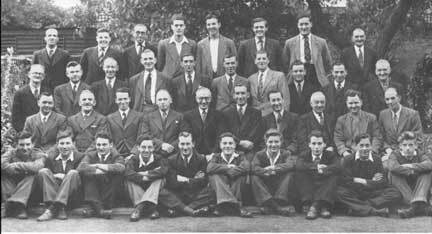 The photo on the right is of the staff of the company taken in August of 1950. The elevator contracting firm of McLean, Hays & Company, organized in New York City by founders McGlynn, Hays and Pearson in 1900, ran four machine shops in New York and New Jersey, manufacturing parts 24 hours a day, seven days a week during World War II. 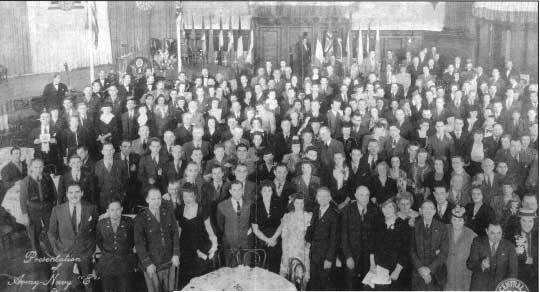 This group photo was taken of company members at war's end - February 7, 1943 - when they received the Army-Navy "E" Award under the leadership of John Hays.